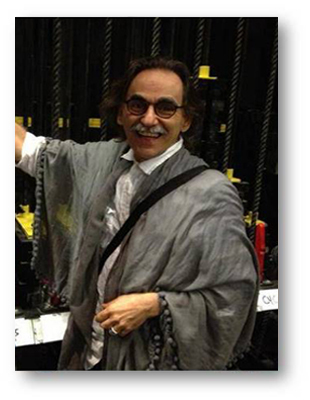 Fernando Calzadilla is a theater designer, dramaturg, scholar, teacher, visual and performance artist with a multi-cultural background that weaves practice with theory to expand the scope of his art. His interdisciplinary practice comprises performance, theatre, ethnography, visual arts, and communication processes from the Performance Studies perspective. He has a BFA in Theater Design and a MA/PhD in Performance Studies all from New York University. He is one of the six licensed rasaboxes instructors in the world. For the last nine years he has been Dramaturg/Resident Artist for Miami Theater Center where he has co-authored with Artistic Director Stephanie Ansin three original plays and four adaptations. He has designed sets, lights, and costumes for all of them. All strands of his practice are centered around the human body, color, and light questioning gender and genre classifications as well as the separation between process and product. Associate Lighting Designer Tammy Srinivas. -Oral traditions and expressions, including language as a vehicle of the intangible cultural heritage. -Social practices, rituals and festive events. -Knowledge and practices concerning nature and the universe. Am I Intangible?Asks the same questions I have been asking in my performances since 2004. Who decides what, which one, where, when, and finally, why?